Teriyaki good pearl in small size. Luxury use 8 tablets a pearl reminiscent of the sea foam in the ear, Politely we finish hand-wound. Form of freshwater pearl, such as the potato. Carefully selected twist of the form that Judiciously Among them have been Otsukuri. Potato ball is compared to the round, not too formal, There is a moderately casual feeling. 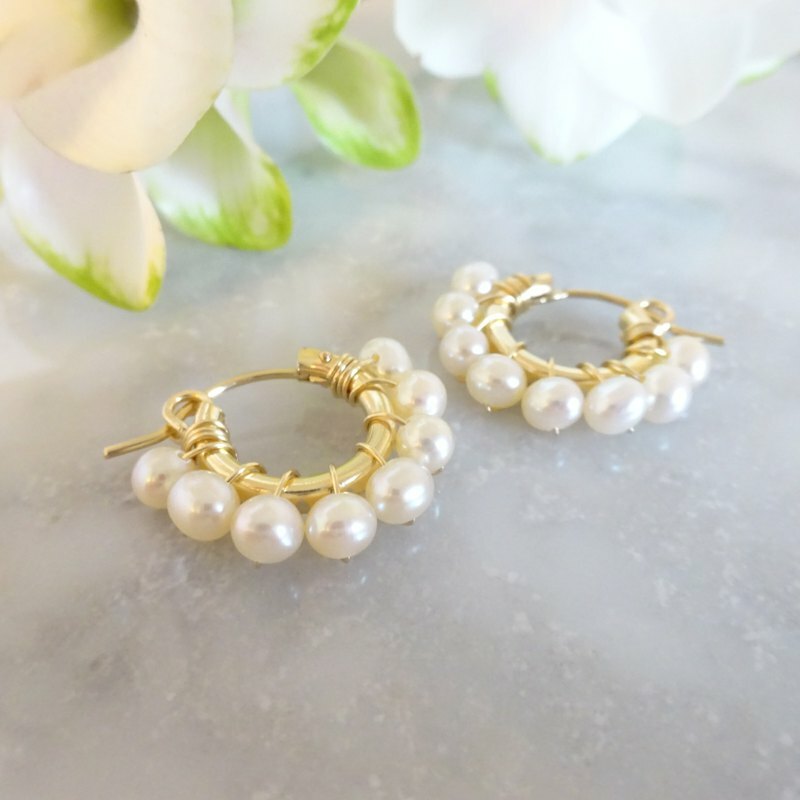 There is a firm presence while small, Natural shine of freshwater pearls, it will be accompanied by elegance in the ear. This time, because the quality of the lot is entered into the hands a lot, We were able to reduce the cost. In town use, and dinner at the resort. . Stone / Freshwater Pearl (potato) Bracket-wire / 14k gold-filled Hoop diameter / normal size15mm (photo no.1,2,3UP, 4UP) pti size 13mm (photo no.3down, 4down, 5) ※ only piece ※ The respective sizes are an aim. ※ The atmosphere of the color depends on the environment of the monitor that you use it, and it's sometimes seen. ※ When it's pulled hard for a handicraft, it breaks. Attentively, please handle it gently. ※ The difference in shipping charge is made the price of the packing material. Please understand. A producing center / production method A producing center: Japan Handmade.